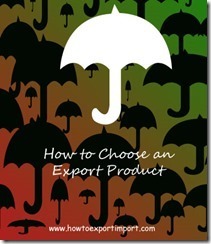 How to select a product for a new Export Business? In this article I would like to enlighten some information about choosing a product for export. gth and weakness in the area of finance, education, personal strength etc. Read carefully about my article on types of exports like Manufacturer exports, Merchant exports, Service exports, Project exports and Deemed exports. Try to go little more deeply on each of them, as I have not been explaining all subjects in my article in detail. Ok, now you can take a scribbling pad, start writing the products or services which you feel, you can succeed in selling based on your strength. Keep writing many products as per preference. Now you can have a strong domestic and international market study and decide which product or services you can make succeed out of the products you scribbled down. Remember, you can choose your wish either for domestic and international market or exclusively for international market depends up on your strength. If you have a family business already in hand, I personally suggest you to develop the same, as you would have already acquired a proper knowledge in succeeding. Also read Export marketing : How to get export orde? Would you like to add more information about selecting a product for export? Share below your experience and thoughts below about choosing a product for export business. Comment below your thoughts and share your knowledge and experience about Choosing products for export business to start an international business. Harjeet Singh: On 28 November 2013 All your articles are very useful for beginers. Thanks for these tips. Pradeep: On 13 January 2014 I am studying company Secretary course .and i want to export my service .pls suggest me how i can provide my service in forein country ? And in which country i got great response? vinoth: On 18 April 2014 my name is Vinoth I am a one merchant exporter and I don't know how to select my product, which product choose easily succeeded,Please give me you are idea till I was waiting. Surendran Kollerath: On 18 April 2014 Hi Vinoth, Find your strength in selling a product by a good market study. Elakkiya Selvan G: On 09 June 2014 How can i order from foriegn countries And Which product i can chose.How can i get license. sandip patel: On 22 July 2014 I want to start for industrial items like valves,pump,electrical panel,led light . how can i contact for foreign byer. Khushal: On 16 September 2014 I want to export agriculture engine and pumps or wooden decorative articles, now I m doing retail engine business please suggest me which one is best for me. admin: On 18 October 2014 Hi Sankar Balakrishnan, You may read http://howtoexportimport.com/How-to-set-up-an-export-import-firm-in-India-ndash-398.aspx for your requirements. subhankar mondal: On 09 November 2014 dear sir, I want to export garment items.how i will choose the foreign buyer.have any govt.institution to choose foreign buyer in India.can you tell me some export finance institution or bank in India. Pratik: On 18 November 2014 I want to start export business. can i make my own product and sale it to other countries or this idea will not work for beginners like me? i also want to focus on ready to eat food products export so how's the market for that?..like diwali snacks,etc. Dhaval: On 03 December 2014 gr8 Blog very useful information. i want to start export business. i want export cumin and fennel seed how to setup my business ? Prashanth: On 05 April 2015 Hello sir , As am a begginer into this field, Kindly guide me on the below queries . I have an idea of exporting fish to other countries, My question is 1.How can i find a international buyer 2.Is there any website for this specially 3.What are all the registration i should do with the government 4.Then how far bank will extend their financial support to do the business. prabhakaran: On 03 May 2015 Dear sir, I am a beginner in this field,I am interest to do agricultural product . Pls guide me how to get contact detail international and how t o choose buyer.Please help me to start a business ..
Prashant Jindal: On 17 May 2015 I want export i dont export you tell me how start export bussiness you give advice.me. MH Agnihotri: On 19 May 2015 Hi,am interested in exporting Fruits especially Mangoes. Here am planning planning to go for lease of other Mango forms. Kindly guide me. Vedaraaj R: On 10 July 2015 How to start the export business and what's products is very good. Please can you give a ideas. T.Govindasamy: On 15 July 2015 Dear sir I am fresh in this export business how to approach and who is the honest buyer and repays persons please guide me. Thanking you With regards T.Govindasamy. mohan: On 16 July 2015 Hi, As iam already having medical shop i need to export medicens is it possible please advice how??? Kunal: On 23 July 2015 Hello, My friend and myself are planning to start exporting vegetables to international markets specially Dubai. We are new to this but as my friend already got farms of these vegetables on the outskirts of the city. Do you think our idea is worth working on. ramesh: On 24 July 2015 I am interest export business but but how to contact address. karan surti: On 05 August 2015 hello sir, I'm very confused to select product for export can you advice me,how to choose product for export ? pls reply sir. TAPAN PATEL: On 07 August 2015 hello sir, this is tapan patel from ahmedabad. i used to read 3 to 4 articles every day of yours and its very good and help full for beginners like me. sir, can you give me some tips for product selection?? my target country is gulf and asia. Diya Roy: On 07 August 2015 Hi,i want to start my own export business and i want a good suggestion for the product which will be fine for srarting the business. Please do give some suggestion for the product which will be comfortable for starting the wxport business. THANKS. ananthic: On 09 August 2015 how i select product, and which country demand that product .which way i trace the client. and what is the rules and regulation and procedures. any idea about it. please share with me in my mail id. ananthaselvi.c@gmail.com. priyabrata mondal: On 11 September 2015 I want to export nursary plant and ornamental fish. I know the process of export but how to get the customer and from which country? Please give me the details of how to fiend foreign customer. Arun J: On 07 October 2015 how to get buyer contacts. Is there website or any means to contact buyers directly. Ashwani Gautam : On 13 October 2015 I want know that I'm not a manufacturer but my relatives are in Australia and I want to start export business with them. Is it possible for us to start the business and if possible then what will be the best way to start as initially we cannot start in a large scale. Kindly guide me I will be very grateful to you. Kaushal Patel : On 13 October 2015 Your website howtoexportimport.com is very informative and useful for someone like me who are new to this domain of Export and Import.I would like to seek your advice on certain aspects of Export-Import. We are into chemical business and trying to diversify our business with new range of products and industry. We have never imported, nor exported any of the products we deal in. There is a business opportunity wherein we can collaborate with the foreign supplier and source their product here in India. Could you kindly advice on below listed query of mine 1. Should we work as an Indenting agent or we import the product and sell it to the end buyer. In case if we work as indenting agent, could you kindly help us understand the roles and responsibility? Is there any CONTRACT / AGREEMENT copy which we could use as a reference between supplier and ourselves? Can you share such copy for our reference? 2. Could you kindly share the standard copy of documents which are used in International trade? We can create our copy based on agreed standard documents of International trade. Purchase Order Copy, Invoice Copy, Quotation Copy, Letter of Credit Copy for understanding 3. Do you have any import/ Duty Calculator sheet, which could help us calculate the landed cost of goods here in India? 4. Are there any websites or portals which could help us understand the freight and Insurance calculation for the goods to import. 5. Are there any government or independent portal which could help us identify the HS Code, duty for the goods to be imported. Last but not the least, what would be your advice to us considering we are new to Import-Export and do not have domain expertise. Narayanan k: On 19 October 2015 Iam BBA CA Graduate.i am intresting export business, u can help start business. Geetha: On 29 October 2015 Sir, I have started the Export business, contacted the buyer, sent the sample, their target prices is not suitable for our price, how to fix the price. CIF & C&F price. Can you help in this. dinesh s: On 31 October 2015 sir..i have import export code..how to product and how to market our product and how to meet buyer..
adarsh: On 03 November 2015 I want to start export business.how much money reqied for full start up . mohan: On 25 November 2015 I want to know the full process of how to export human medicine to india. aneesuddin sheikh: On 06 December 2015 i have 10 acres farm .. and we have apple ber in it .. now i want to export that to any country ..will u plz guide me? Whats the procedure for it? Export Genius: On 04 January 2016 I really impressed with the way this post has been written, Well if anyone wish to have more information about import and export business- so need to not worry get contact with ExportGenius- an export and import data provider, Thanks for sharing this informative post post. Surya T: On 07 January 2016 Hi..i am going to start export business.how i select product, and which country demand that product .which way i trace the client. and what is the rules and regulation and procedures.. give ur sugsuggestions..
Dinesh Shah: On 10 January 2016 Hi i want to start export business in manufacturing of mechanical machinery parts.But i doesn't have any idea. I am Mechanical Engr. having with 36 years experience . I am manufacturing plastic machinery parts screen printing machine parts & textile machine parts.Pl guide me and give me good suggestion . Thank you . hirdesh kumar : On 10 January 2016 Sir, I am very new seller or exporter i have some products to export like- artificial jewelry, some cotton items. gurpreet singh: On 05 February 2016 I want export i dont export you tell me how start export bussiness you give advice.me. Deepakmogha: On 07 February 2016 I want to do export bussnise but how to possible pls help me..
shubham: On 07 February 2016 sir i am doing chartered accountancy course and i am into the finals. I want to do export/import of goods or services but i am very confused. Please help me how to start with. MUHAMMAD REHAN: On 16 February 2016 Sir I am electronices engineer iam interested in export. Import business i will take which type of business. Please give any idea. Ranjan Roy: On 04 March 2016 Dear Sirs, I wish to start Export Import business and how it could be start in a systematic way. Please help ! Thanks. Ramesh Kumar: On 10 March 2016 Dear Sir, I am working as a Purchase executive, i would like start export business with low budget. how do i go about. kindly help me. vijayakumar: On 04 April 2016 Sir, i think something do special in my village. that's why i'm choose export business, but i don't know which product select,then how the response for my selected product. Dhruvajyoti Patgiri : On 18 April 2016 I am looking for guidance in doing export business.Waiting for your reply. Subodh Kumar : On 18 April 2016 Please you advice for export business to me proper guide line in export business and risk management. Mitesh Shah : On 18 April 2016 I'm strongly interested in Export / Import / Shipping / Maritime Business and have a strong back up of certain business class people. The entire set up is ready to commence the business of export / import but we are unable to decide which product to choose initially for export to start with. Same way for Import Also. Can you guide us as to how to click our first export / import shipment.If possible…? we are eagerly needed guidance, hence please revert. SUSHANT: On 25 May 2016 I M AN ARCHITECT I WANT TO GIVE MY SERVICE TO OUT OF COUNTRY,HOW CAN I DO ? Archana suresh : On 05 August 2016 Let me introduce first, that just now I have started export business in the name of yes yes worldwide. One of my party required incence stick sample from me thro courier. How to do that. Is it possible and will you give your advice How to do that. piyush kumar : On 13 August 2016 I want to start with the new business of Import/Export. It will be great if i get your guidance on the same. elahe: On 06 November 2016 sunday hello sir , im from iran and i want to start an export business i have a small olive garden can you help me for export my gardens products?? P. Venkatesh : On 20 November 2016 My name is Venkatesh. My age is 52 years. I am working now.I want to enter in to export business. Recently, I have a chanceto visit your blog and wondered the details you fed.Really it is a great work. Is it possible to download in pdf form? I want to learn from thebasics. In your blog, there are lot of information related withthe "Export Business".So, if you provide me all the details in the pdf form, i will downloadand read and do export business step by step. Murali . A: On 22 December 2016 I want to start vegetable items export business. Pl guide me for complete procedure. Priyadharshini: On 23 December 2016 I would like to start the export business of siddha medicinal valued plants. Kindly suggest which countries will require this. kuldip: On 01 February 2017 tell me, i m merchant exporter, then which product i should select ? and how i find supplier for that in india ?? give answer fast..
Harsh : On 14 February 2017 Hello Sir, I m interested in doing export business in textile industry. Please provide me useful information on how to select a product and sell it in international market. seaireximsolution: On 10 March 2017 Amazing Articles. P.C.ENTERPRISES : On 07 April 2017 Hello sir, i have recently been through your website www.howtoexportimport.com and have found it to be very helpful. A small introduction about me, i am currently involved in our family business of distribution for fmcg products in Pune. Along with this, i am starting a manufacturing company in the sector of spices. My primary focus is exports and would like to know more about the procedures and the best practices to be adopted in this regard. If you can, kindly guide me further in this. Abhishek Patel : On 24 April 2017 I have started my new business. I need guidance for export.Please guide me for products. Arun Arun : On 11 June 2017 This is arun from Coimbatore, Tamil Nadu. i would like start export business and i want to know which product is best for export and how to do? Nissar Ahamed: On 13 June 2017 I am new to export business and your website is very useful to understand the various concepts in export and import. I am very much confused on the product selection, can you please suggest the products that can be exported with small amount ie 1 to 2 lakh. Meena Ravi: On 13 June 2017 I have just registered an export company through which I plan on exporting commodities like rice, spices and cereals. However, as I am new to this business I need your help in making me understand all the legalities that need to be done and getting financial aid. In brief, I am interested in some export business consultancy. Kindly get in touch and aid in the betterment and growth of my company. ArunPrasath S: On 17 July 2017 This is arun from Coimbatore, Tamil Nadu. i would like start export business and i want to know which product is best for export and how to do? Jason Betts : On 17 July 2017 I wondered if you had any specific advice about products or services which you could recommend when starting up? I would be truly grateful for any other insights you could share. Sathish Kumar : On 17 July 2017 i am a new exporter interested in exporting the apparel related products, but i am struggling to choose the right products for export. Shubham Jain : On 17 July 2017 I am also interested in exporting products from India, but i am confused about which item to export and where to export. I would really appreciate if you can help and suggest me regarding export from India. Mustafa Khundmiri: On 21 July 2017 Recently came across your website (Howtoexportimport.Com) and went through some of the articles. 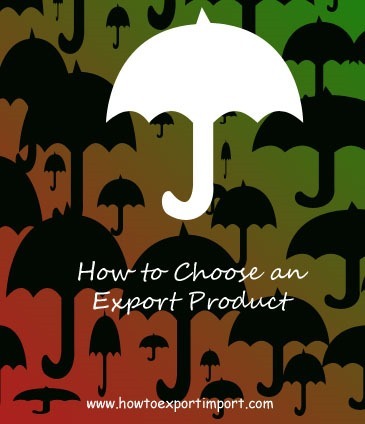 I especially liked: 'How to Choose a product for export business' as it was written in a clear, concise manner and informative manner. It's always nice to see content that contains less fluff and more coherent information. prasanth: On 19 August 2017 Dear Sir I want to start export but no idea about the products and getting buyer. prasad gosavi: On 25 November 2017 dear sir, I have basic knowledge of export,i wanat to start my own export related business, what product i select , how to find customer i don't have knowledge about that please guide mi. Jagadeesan : On 18 January 2018 Sir, I would like to have more knowledge and your guidance on product selection for export.. Please guide me sir. Dr Devendra: On 27 February 2018 i am a vascular surgeon in india . i want to duvert in import export business from india to any country and from australia.to any country. two sites. rohan kulkarni : On 14 March 2018 I was searching information regarding the export of Agarwood from India and I that's how I came to know about your website which was very informative. I want to register a import export firm and want to export Agarwood from India. While doing research I came to know that permission from CITIES is required. Can you please help me with the information for taking necessary permission from CITIES for export of Agarwood. Shubham : On 14 March 2018 My name is Shubham Jain from New Delhi, I was just doing some research regarding the Export business from India and i landed onto your blog. I really appreciate the knowledge which you have shared with us. I am also interested in exporting products from india, but i am confused about which item to export and where to export. I would really appreciate if you can help and suggest me regarding export from india. I am very small trader and currently have a very small Paidup capital. I have many other ideas which we can implement, but first i need your advice in order to start. looking forward to hear from you. Srikanth Ankem : On 14 March 2018 I got your mail id from web site. I am looking to import following products from Australia and need an agent who can get this done for me. I would like to know the procedure to get these products imported. Do we need to register these products in India before we import? 1) Iluminesse® Seaweed Moistening Cream = HS CODE = 33049910 = FACE CREAMS. ( COSMETICS) 2) Iluminesse® Deep-Cleansing Face Mask = HS CODE = 33049990 = OTHERS. ( COSMETICS) 3) Iluminesse® Vitamin C Serum = HS CODE = 33049990 = OTHERS. ( COSMETICS) 4) Iluminesse® Mineral Scrub = HS CODE = 33049990 = OTHERS. ( COSMETICS) 5) Iluminesse® Facial Wash = HS CODE = 33049990 = OTHERS. ( COSMETICS) 1st consignment details are: We expect that the first pallet will contain approximately 100kgs of 5 products and the weight of the unloaded pallet is approximately 43kg tare (nett) weight. Its dimensions are approximately: length 1,100mm, width 1,100mm and the height 150mm. vivek agarwalla : On 14 March 2018 This is Vivek Agarwal. I want to get into export import business, need some consulting. Kindly let me know when can we meet. Sagar Jadhav : On 14 March 2018 Hope you are doing good. I am Sagar currently working in IT in USA. I am more interested into Food Processing Industries ( specially Spices ) and exporting them. I have been reading your website howtoexportimport and it is very helpfull so far. Just wanted to get some advice from you on spice manufacturing and its export scope. Also my background is more into computer/IT field but wanted to do business that job so it would be really helpful if you give me your valuable advice. Srinivas Prasad : On 14 March 2018 I am Srinivas from Bangalore and i have a small company of my own. I wanted to diversify into imports and exports. Sir i want to get a clear picture of how import export works, what is the best commodity to import and get license for it. I thought i could use your good advice as you are a pioneer in this field. With lots of hope, i request you to kindly guide me. I am sure that you will help me in this regard. Deepan Balu : On 14 March 2018 My name is Deepanraj. I am from Tamil Nadu. I am planning to start Export Business. I need some advice. Vikram Randive : On 14 March 2018 I am Vikram I want to start the export business to export wheat floor ,So how can I start my business and how I can contact to vendor . Heaven Fuzzy : On 14 March 2018 I want to import parrots live animal pets from USA to India..? Please may I know the process for this, and what are the procedure for this. frank: On 27 March 2018 I wan to export sea shell which are NOT IN BAN. Can anyone help me? Jagadeesan: On 11 June 2018 Dear Sir, I am struggling on product selection for my export business, Can you please advise what are the factors should be consider during product selection for new export business. Nehal Sutariya: On 02 October 2018 Hello sir, I am Nehal Sutariya, working as a business consultant in Ahmedabad. we are providing full guide to start Export and Import Business. we give guidance for export business from company inception to deliver the first order. you can also contact us if we can help you in this. connect2india: On 24 October 2018 this article is very helpful and knowledge. Alagar: On 13 March 2019 While importing Sea foods, customs dept asked Fssai certificate. Now our goods are in customs Area. We planned for Fssai registration. But, Fssai dept said that central license registration takes 1 to 2 months. In this case, what we have to do. Bcoz, lakhs value of goods stukked. Kindly guide me. Thanks in advance.